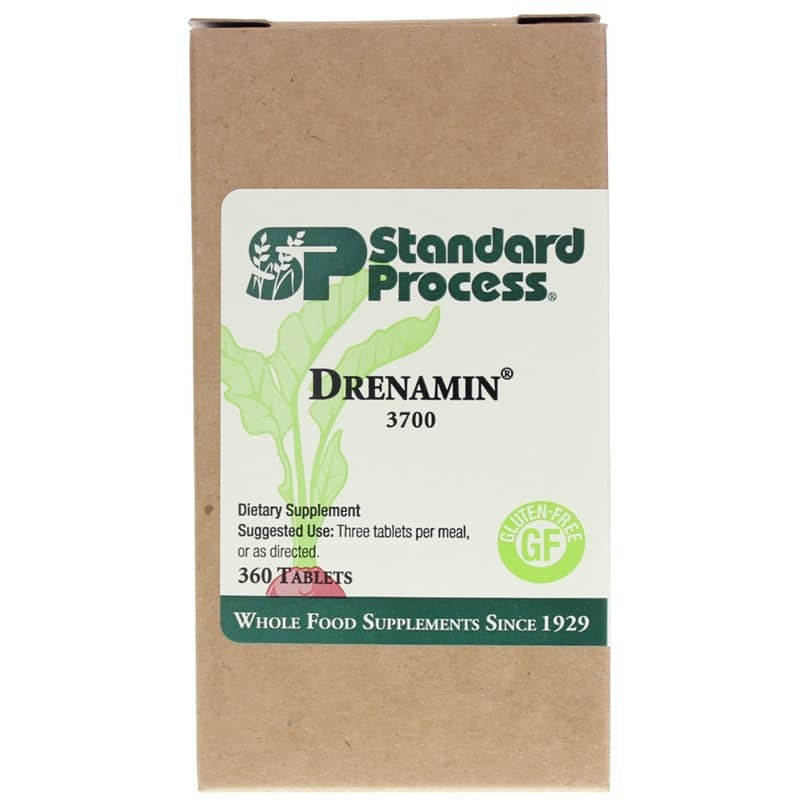 Drenamin by Standard Process is a natural stress relief support supplement that supports adrenal function and helps maintain emotional balance. 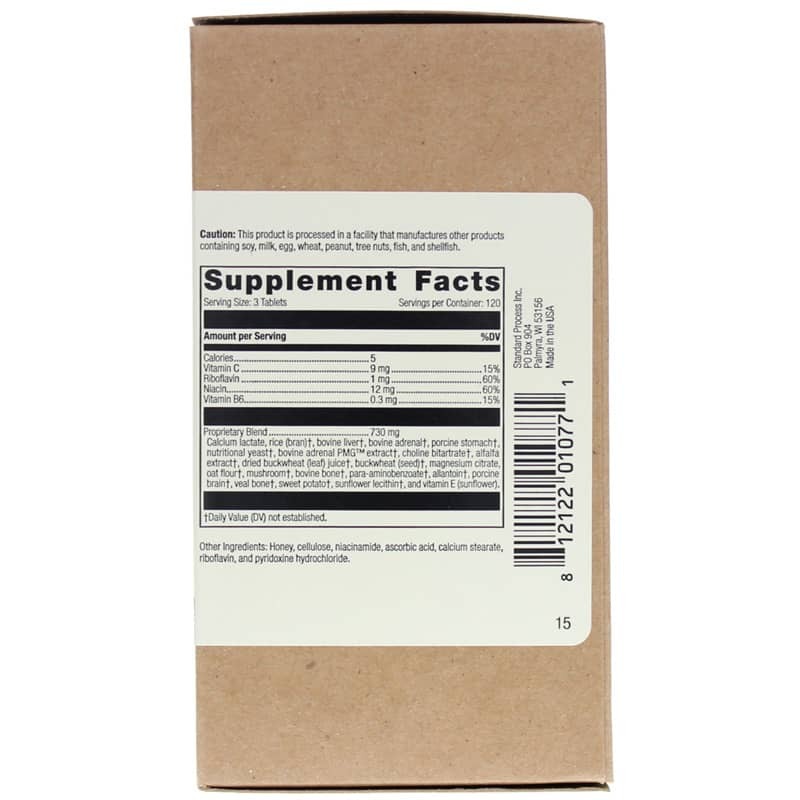 Calcium lactate, Rice (bran), bovine liver, bovine adrenal, porcine stomach, nutritional yeast, bovine adrenal PMG extract, choline bitartrate, alfalfa extract, dried buckwheat (leaf) juice, buckwheat (seed), magnesium citrate, oat flour, mushroom, bovine bone, para-aminobenzoate, allantoin, porcine brain, veal bone, sweet potato, sunflower lecithin, rice (bran), and vitamin E (sunflower). Adults: Three tablets per meal, or as directed. My family takes Catalyn, Drenamin, Cataplex B, Cataplex C, and Calcium Lactate. After we took these for a year or two, my husbands allergies ceased to exist. He used to spend several miserable weeks in the fall. I'm not sure which supplement is responsible for this improvement, but I suspect it is Drenamin. Started on Drenamin by Standard Process. A product is a nice balance of safe, effective and gentle. I always appreciate the whole food ingredients in Standard Process products. Drenamin always works well for me. Promptly received order, well packaged. Love it seems to help keep the balance in a over stressed life .